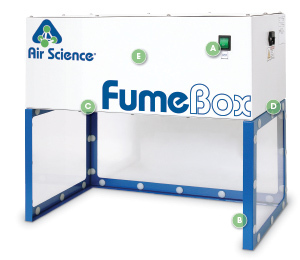 Fume Box™ ductless enclosures are designed to protect the user from chemicals, vapors or powders during low-volume chemical manipulations by effectively containing low concentrations of noxious fumes, vapors or powders. Low-profile, completely portable, no ductwork required. Compact size, easily positioned on shallow countertops or counters with overhanging wall cabinets. 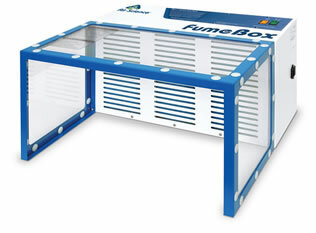 Clear viewing enclosure prevents chemical splash. Modular design permits multiple configurations. A. Main On/Off Switch: High quality rocker On/Off switch controls unit power. Frame: The chemical resistant epoxy coated steel frame adds mechanical strength. C. Electrostatic Pre-Filter: The 99.5% effective electrostatic pre-filter is accessible from inside the chamber to contain the release of any particulates that it traps. D. Color: The cabinet is white with blue trim; side and back panels are clear. 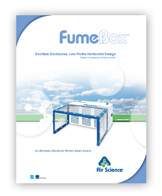 E. Enclosed Filtration Chamber: Main filters can be carbon and/or HEPA/ULPA to fit a variety of containment needs.